The LGBT Center of Raleigh is one of the most successful community centers in the country, attracting national attention for it’s programming and for it’s management. Functioning as Raleigh’s LGBT community flagship organization, The Center is led by a 14-member board of directors, has two full time paid staff, and utilizes more than 400 community volunteers to ensure that all LGBT people in the Research Triangle have a voice. Our Center provides direct program services to the incredibly diverse community, including youth programs, SAGE Raleigh, HIV Testing and Counseling, and an amazing Transgender Initiative … just to name a few. The LGBT Center of Raleigh is a registered 501(c)3 not-for-profit organization. Donations are deductible to the fullest extent allowed by law. Donations made to the General Fund go to the day-to-day operations of our intimate Center. Every dollar goes to ensuring that the Center will stay open with all its wonderful programming. The General Fund is the lifeline of the Center and is always in need of support. You can make a tax-deductible donation to the LGBT Center of Raleigh’s General Fund as a single online payment, a recurring monthly online payment, or as a payment by check. Please click the link below for your preferred donation method and provide us with donor information and to make your payment. For online payments, we’ll send a payment confirmation email to the email address you provide in the donor information form. That email will be your tax receipt and we suggest you print and file it with your tax information. At the LGBT Center of Raleigh, we rely on the generosity of our community, dedicated volunteers and amazing corporate sponsors to help us deliver our services. 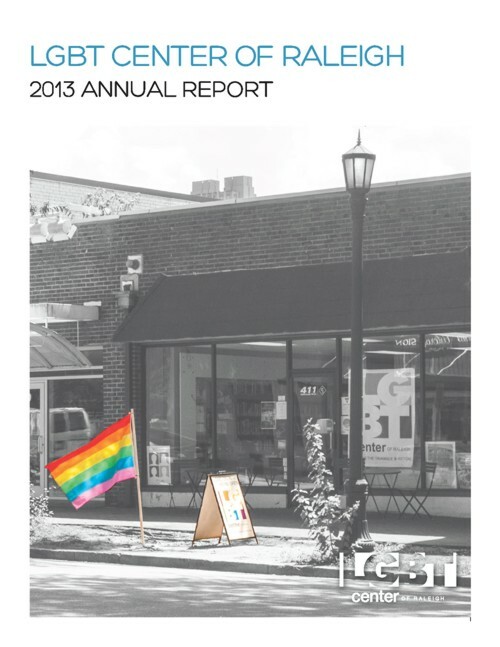 Whether it is providing a safe space for an LGBT Youth, finding a culturally competent health referral for a community member, providing over 15 different initiatives for our diverse community, or just offering guidance for coming out to friends or coworkers, the LGBT Center excels in providing top-notch programming for the Triangle. Your planned gift will help ensure that the Center will be able to consistently offer opportunities to the community in the present AND in the future. 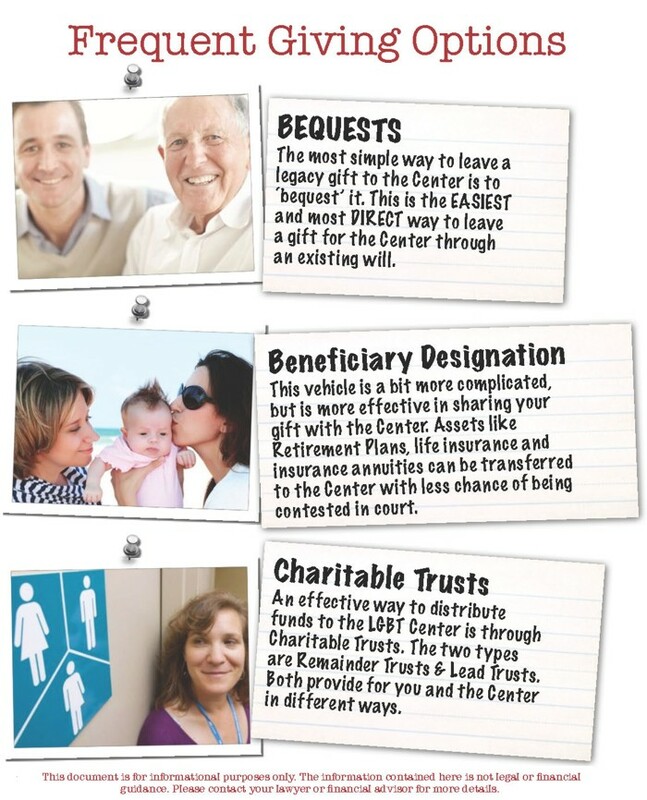 Have you already designated the Center in your Planned Giving? LET US KNOW! We don’t want to have to wait to thank you for your future gift. Please download this form and send it back to us. Your dedication to our Center is what keeps us going. Go to the www.Kroger.com and link your card to the LGBT Center of Raleigh. Log in to Amazon Smile and select LGBT Center of Raleigh as your charity. A percentage of your purchase goes to the Center. Use Goodsearch.com as your search engine, and select LGBT Center of Raleigh as your organization. Your personal information that you share with The LGBT Center is always treated with respect for your privacy and your wishes. If you wish to be an anonymous donor, please make it clear on your method of payment. For checks, please put “anonymous” in the memo line, and for Credit Card transactions, the online form contains a question for you to answer. We want to respect all donor wishes.